10 x 10 Shed - Who Has The Best? For those who are looking for a mid sized, versatile garden building, a 10 x 10 shed is hard to beat. Whilst it’s not so large that it will take over the garden or look too obtrusive, it’s still large enough to store all the gardening tools and equipment that a small to medium sized garden could typically need. It’s also sizeable enough to double up as a small scale workshop for a hobby, or even for people working from home. Thanks to this inherent flexibility there’s a wide selection of sheds available to buy in this size today, which is why WhatShed have created this useful guide that will help you find the best 10 x 10 shed for you out of the 20 best that are available to buy online in the UK today. With so many 10 x 10 sheds available from many different manufacturers, selecting the 20 best was no easy task. We achieved it by taking into account a number of factors including cost and value for money, build quality and appearance, and any additional features which give the consumer extra value for money. 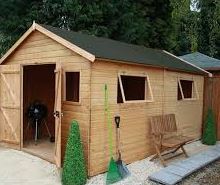 There are sheds to suit all budgets here, but they are all high quality garden buildings with something special to offer. With such a wide and varied range of 10 x 10 sheds to choose from, selecting the very best available to buy online today was not easy, but we’re pleased to have a selection that has sheds in all styles and to suit all budgets. 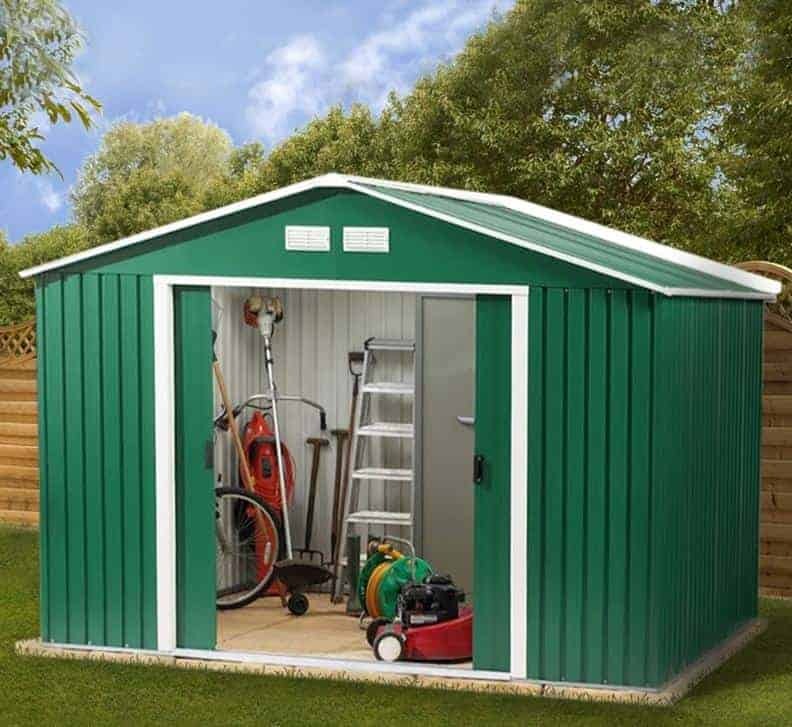 Congratulations then to the Yardmaster green metal shed with floor support kit, which takes the accolade of being our number one 10 x 10 shed. Whether you want a large metal shed, or a compact wooden shed, WhatShed bring you the detailed and independent reviews that can help you make a great choice every time. Even in a competitive field this was an easy selection as the very best 10 x 10 shed available to purchase online in the UK today, as not only does it have a host of great features it’s also cheaper than any other shed that features in the top 20. It’s made of metal, or galvanised steel to be precise, which may put some traditionalists off but this brings with it a wealth of advantages, and we found that it looked quite appealing with the green coloured body of the shed and a contrasting white apex roof and white double sliding doors. Being painted inside and out, and of course free from rust, this is a maintenance free garden building which makes it ideal for those who have little spare time. We were also pleased to see that it comes with a 12 year manufacturer’s guarantee against rust, and we wouldn’t be surprised to see it last much longer than that without any perforations appearing. What really makes this 10 x 10 shed stand out from all the others however is the inclusion of the floor support kit which means that a wooden floor can easily be installed and it will then be raised above the surface and protected from the risk posed by ground moisture. It’s a value adding touch that takes this already affordable shed to the top of our league table. 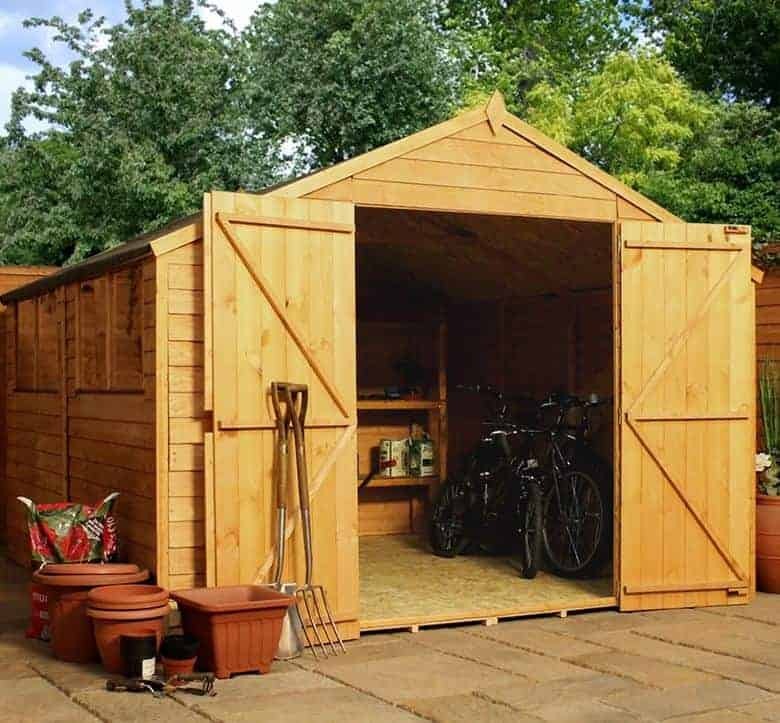 The excellent value for money that metal sheds often provide is shown by it being the substrate used for the top two 10 x 10 sheds in our league table, so if you’ve only had timber sheds in your garden previously then this is well worth considering. Like our number one 10 x 10 shed this also boasts green cladding, but this time it’s in a darker shade and is only broken by white trim around the double sliding doors and the integrated ventilation panels on the gables. We found it very pleasing on the eye and it should also fit in well with a green garden background. Both this metal shed and the Yardmaster one above it have no windows, so you’ll need to have an artificial light source ready, but this in itself can act as a boost to security. With steel cladding it’s a tough looking shed as well, so these factors alone can keep opportune thieves at bay particularly if a padlock is added. 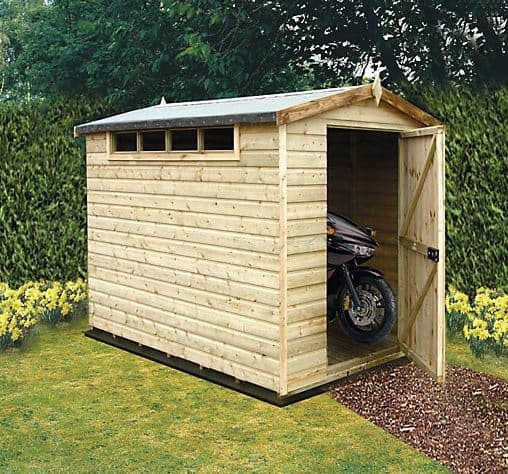 One additional feature that we particularly appreciate about this 10 x 10 shed is that it has a strong entrance and exit ramp attached, making it easy to use a trolley or wheelbarrow to move heavy objects in or out, or as the metal cladding is fire resistant it can also be used to facilitate the storage of motorcycles. If you want a 10 x 10 shed that’s going to be very long lasting and which won’t need any extra treatments lavishing on it once it’s been installed, then a plastic shed is hard to beat, and the Duramax Woodbridge shed is a perfect example of that. It’s more expensive than the metal sheds which occupy the top two positions in our league table, yet we still think it provides good value for money as it can’t rot or rust, is free from worries about insect or rodent attack, and the ivory coloured PVC coating won’t fade in the sun. For these reasons, even though it comes with only a 10 year warranty from the manufacturer we would expect it to last much longer, and it will fit in nicely with properties that already have beautiful PVC products such as fascias, soffits or a conservatory. One of the things that gives this imposing garding building such strength and stability is that it has a strong steel core which has then been topped with fire retardant cladding. The result is perhaps the toughest 10 x 10 shed that we’ve reviewed, and yet it’s still very easy to assemble. The only downside is that an anchor kit, or set of fixing screws, will need to be purchased separately but these won’t add significantly to the initial purchase price. The highest placed timber shed in our list of the very best 10 x 10 sheds available to buy online in the UK today is manufactured by BillyOh, a maker of high quality timber sheds. As with the many other timber sheds we’ve reviewed by this manufacturer it comes without a floor, but even if the customer opts to add a floor for around a hundred pounds, rather than simply fixing this 10 x 10 shed to a level concrete surface, we still feel it represents good value for money for such a well built and good looking garden building. The first thing that caught our eye was the bank of six fixed windows that run across the breadth of one of the side panels. This means that there’s lots of natural light in the interior, thus making it a pleasant environment to spend time in as you look out over the garden. 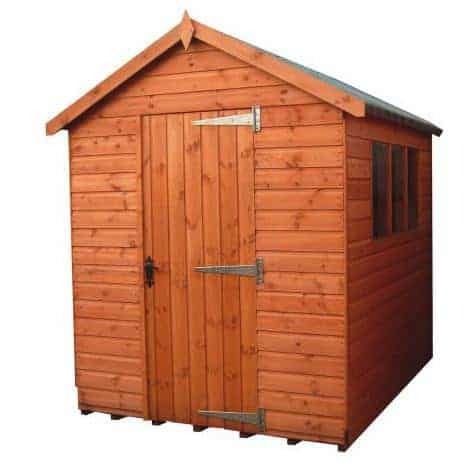 The front is dominated by wide opening double doors that like the rest of the shed are made from premium grade tongue and groove cladding that’s covered by a 10 year guarantee against rot. For people who love the sight of a traditional timber 10 x 10 shed, this could be the perfect choice at a relatively affordable price. This typifies what many people think of when they imagine a 10 x 10 shed, so for people who love the classic look of a large timber garden building this can make a great addition to their property. We were pleased to see that 12mm tongue and groove cladding had been used throughout, which isn’t always something that we find even on the more expensive wooden sheds, as this means that water is kept firmly out. This is also helped by the pitch of the apex roof which reaches up to a height of 2.55, and which means that there’s plenty of room to move around in as well as a lot of vertical storage space. At the centre of the front face are double hinged doors that open to a width of 1.33m. These are some of the widest doors we’ve seen on a timber 10 x 10 shed, which is especially good news if you plan on moving items of furniture or possibly electrical equipment inside. At either side of the door are two square windows, and there are four more windows on the sides, which we were pleased to see opened to allow ventilation in. 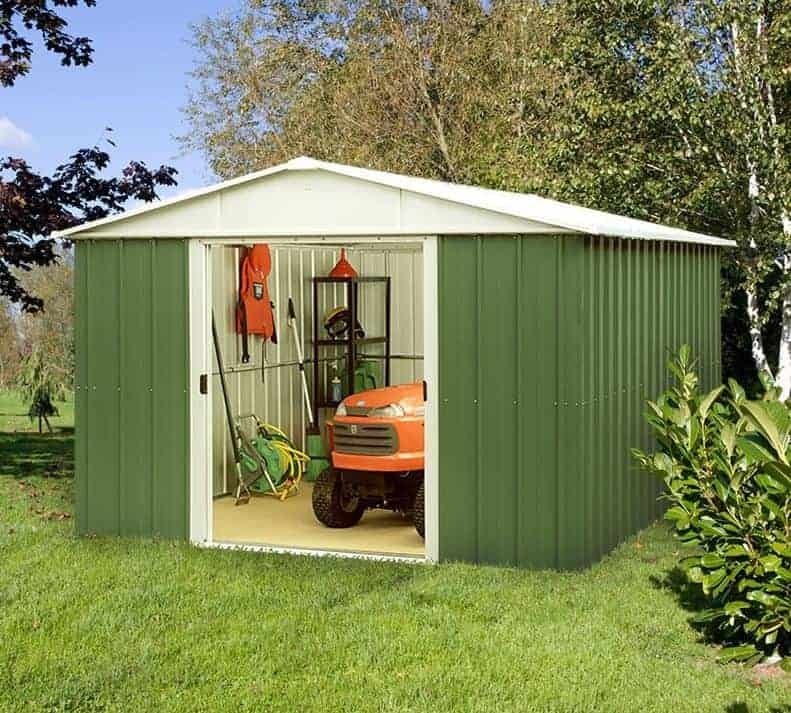 With a 10 year manufacturer’s warranty included as well the only negative element to this good looking shed is a relatively high price tag. 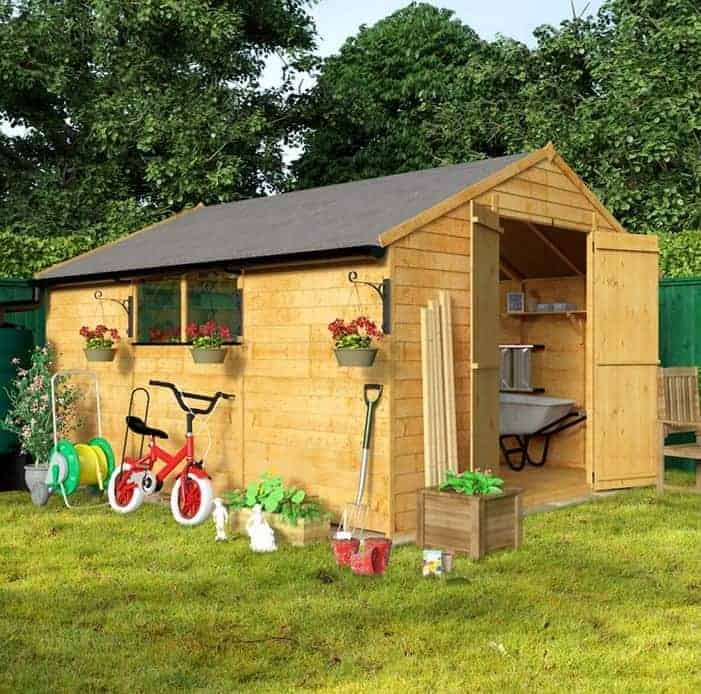 There are many people who could benefit from the storage or workshop space that a 10 x 10 shed provides, and yet don’t think that they have enough space in their garden to accommodate one. That’s where this pent shed can come in very useful, as its pentagonal design makes it easy to fit into a corner of the corner, thus saving valuable space on the lawn. 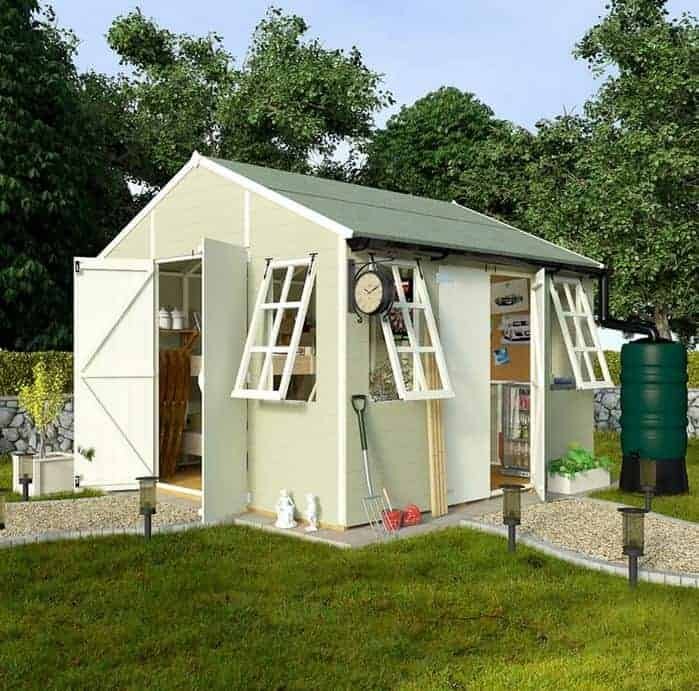 This added practicality is just one of the reasons that this tough garden building makes it into our list of the 20 best 10 x 10 sheds available to buy online in the UK today. We’ve often reviewed corner sheds in smaller sizes, but this is highly original for a shed with such generous dimensions. As always with such sheds a little interior space is lost due to the cut corners of the building, and yet in this case the wide opening double hinged doors which occupy the front face allow the owner to make the most of the space that is available. An opening window is placed on either side of these doors, which provides a good supply of natural light to the interior, and we were also impressed by the use of heavy duty framing and tongue and groove cladding which is covered by a 10 year warranty. Overall, then, we feel that this is a space saving 10 x 10 shed that’s hard to beat. 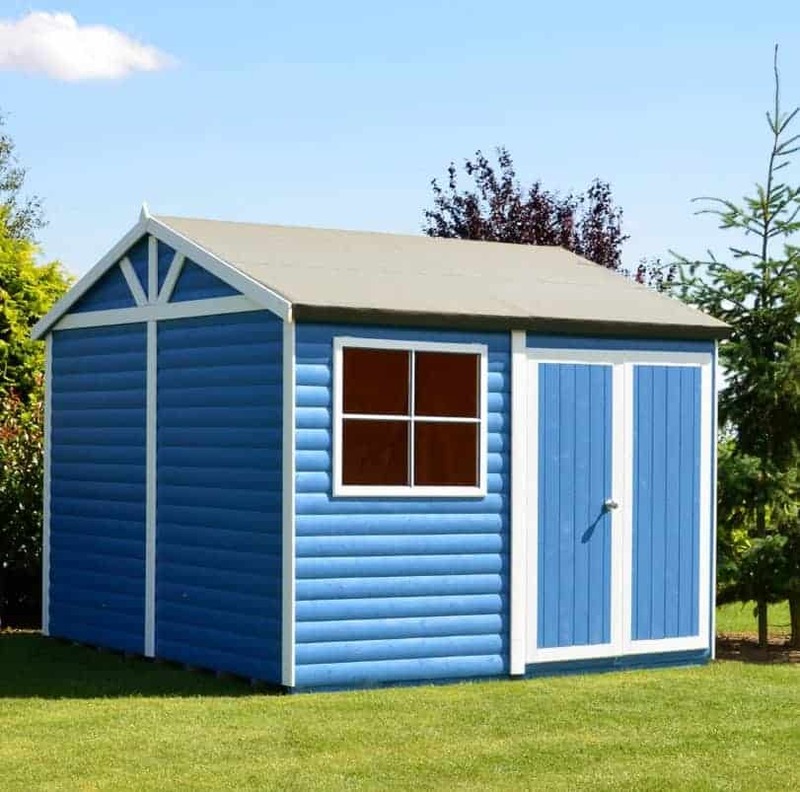 Those who want ultimate value for money in a 10 x 10 shed would be wise to concentrate on metal clad sheds, but we know that many consumers prefer the traditional look of wooden sheds that can come with a price tag of several hundred pounds more. It doesn’t have to be like that, however, as this low cost timber shed from BillyOh shows. This is their entry level model, and whilst this will make it accessible to many more people we still found its rustic appearance very pleasing on the eye. One of the reasons that this faithfully reproduces the rustic style of earlier garden buildings is that it has overlap cladding underneath its apex roof. Whilst this is considerably thinner than the tongue and groove cladding we’re used to seeing it’s still very good at carrying rainwater away, and it also comes with a 10 year guarantee although in common with other sheds that have only had an initial dip preservative treatment this is dependent upon the customer carrying out their own annual retreatments. There are two fixed windows and double doors, but a floor is only an optional extra. 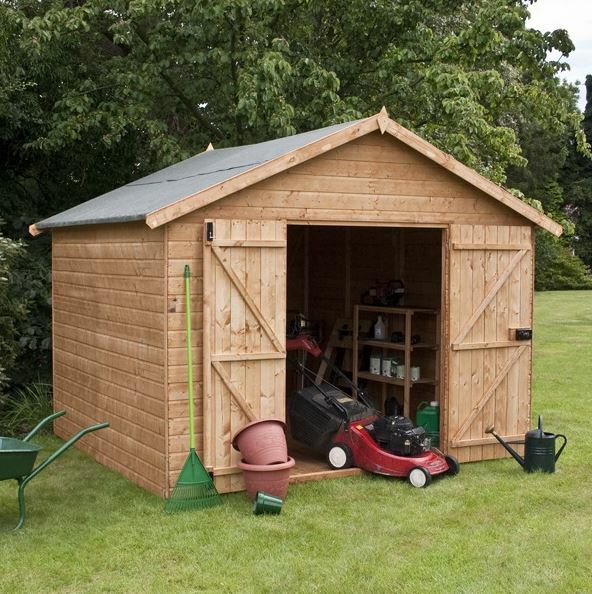 Even so we feel this represents excellent value for a good looking wooden 10 x 10 shed. Shed security is increasingly important in today’s world, which is why we always recommend adding a padlock to sheds that don’t already come with their own secure locking system. A further security boost can be provided by having a shed with no windows, but with a building as large as a 10 x 10 shed that means you’ll have to go to the trouble and expense of installing an artificial source of lighting if you want to spend any time inside it. This neat pent roofed shed offers a perfect compromise, as it has a row of four tiny windows placed at the very top of the most elevated side. This means that whilst an adequate amount of natural light is permitted to enter the shed, passers by won’t be able to see if anything valuable is being stored inside. Being a pent shed this is also a little shorter than most of the timber 10 x 10 sheds we review, reaching a peak of 2.13m on this occasion. This also can be used as a security feature as it means that the shed may be able to be hidden out of the way behind a wall or fence. 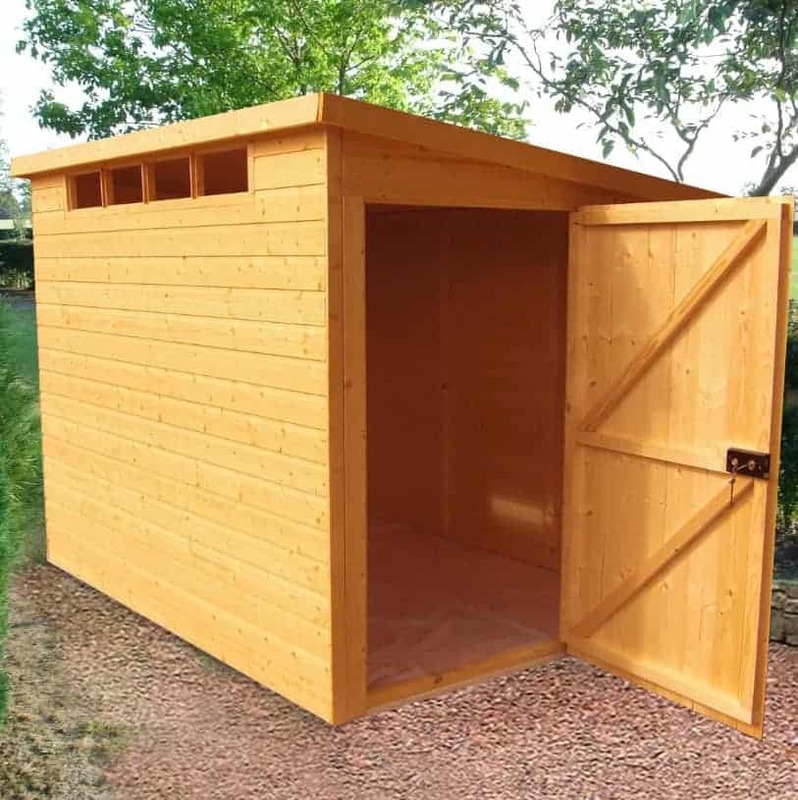 Further to this, we were pleased to see that a key operated lock is included as standard, and that it features tongue and groove cladding and a strong 45mm frame, making this a secure and reliable 10 x 10 shed. One of the things that we liked most about this 10 x 10 shed is that premium tongue and groove cladding has been used for both the walls and the roof, with a tongue and groove floor being available to add as an optional extra. This not only means that the structure feels solid and stable once assembled, it also means that it looks very attractive and from the moment we saw it we could tell that this was a high quality garden building. As with others in the BillyOh range it’s also covered by a 10 year warranty, although this will be dependent upon the customer keeping on top of an annual treatment schedule. The other feature that we liked, and which elevated this into the upper half of our top 20 list, is that it has two sets of double doors, as well as four opening windows that can be used for ventilation purposes on hot days. This profusion of doors is unique for a wooden 10 x 10 shed, and makes it very easy to move objects in and out, or to use different sides of the shed for different purposes. 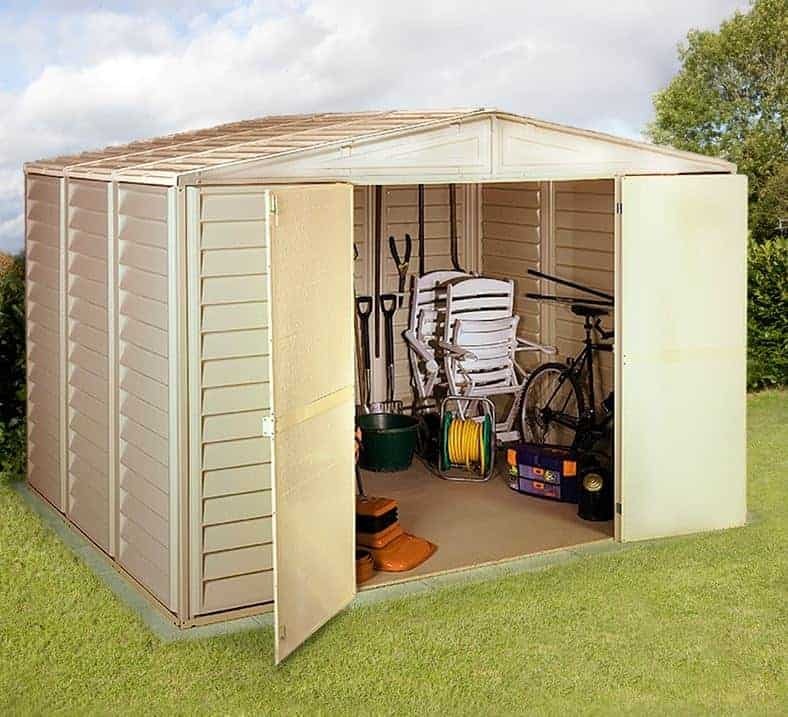 This added concenience also adds value and so we feel that this represents good value for money for consumers who want a well sized shed that offers something a little extra. If lighting is installed, we feel this would make a very good workshop because it’s a secure environment to store expensive machinery, tools, or computing equipment. This is helped by the lack of windows which keeps the contents secret, and therefore less likely to be targeted by an opportune thief, but also by the inclusion of a key operated rim lock as standard. This is something we always look for in a 10 x 10 shed, but unfortunately it’s not always something that we see. 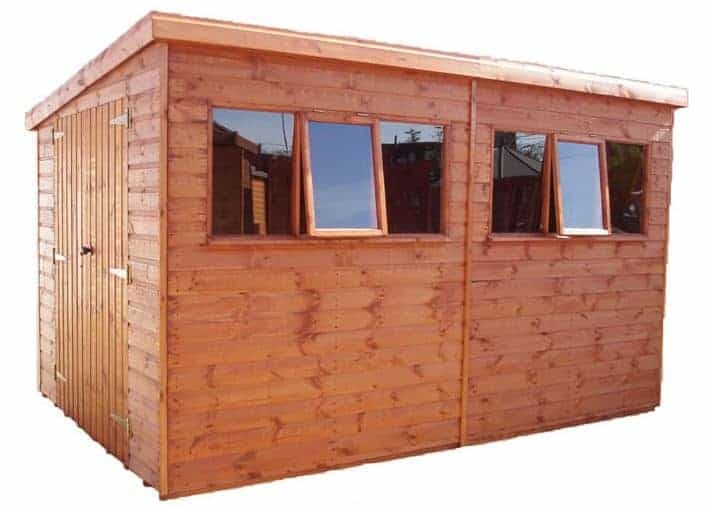 We also welcomed the extra structural strength provided by the thick, planed and rounded framing, and whilst this isn’t the cheapest shed, at just under a thousand pounds, it is sturdy and durable. 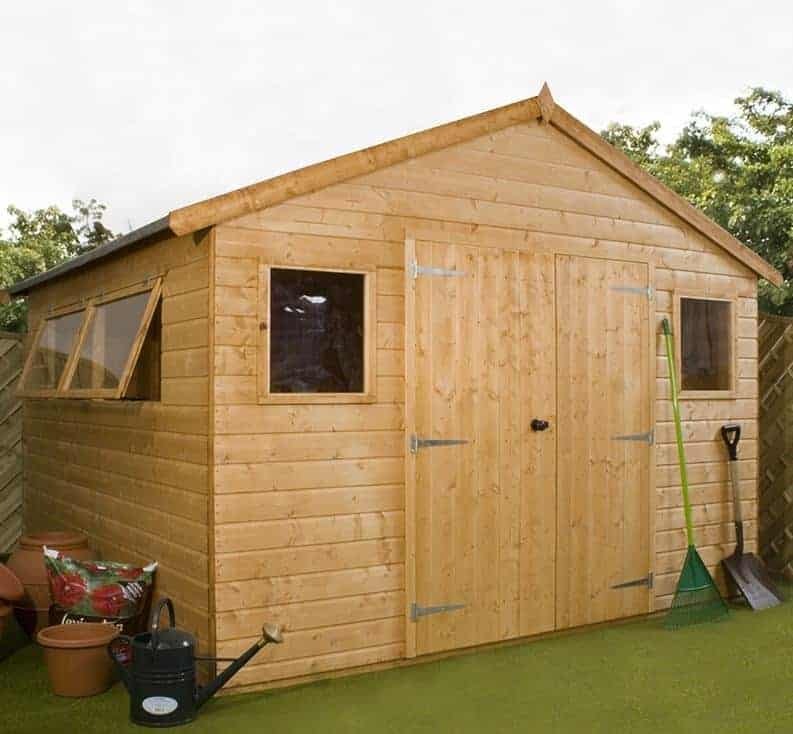 This is the second overlap 10 x 10 shed and whilst it offers some features that the BillyOh model doesn’t, an integrated floor for example, it’s higher initial asking price means that it achieves a lace further down our list of the top 20 10 x 10 sheds that can currently be bought online. At 7mm thick, the wall cladding is the thinnest that we’ve seen, although we were pleased to find that the solid sheet roof and flooring were slightly thicker, with a thickness of 8mm and 10mm respectively. This also means, however, that the shed is lightweight and easy to assembled and this is further helped by the modular nature of the cladding which allows for a quick and trouble free installation as long as the instructions are read. The double doors at the front have a width of 1.33m which makes them wider than most that we see on a timber 10 x 10 shed. They also have an accommodating height of 1.78 so you won’t any problems manoeuvring tall or wide objects inside. Also impressive were the four fixed windows, which being made of styrene are tough and shatter resistant. This, then, is well worth considering for those who see price as the main criteria when selecting wooden 10 x 10 shed. The 5000 Greenkeeper sheds from BillyOh are some of the most aesthetically pleasing mid to large sized sheds that we’ve seen and that’s because they strike an ideal balance between timber and glazing. At the front are wide opening double doors that have been braced to give them extra strength and resilience, and to either side of these doors are two fixed windows. The sides also have a profusion of windows, including an opening window on either side. 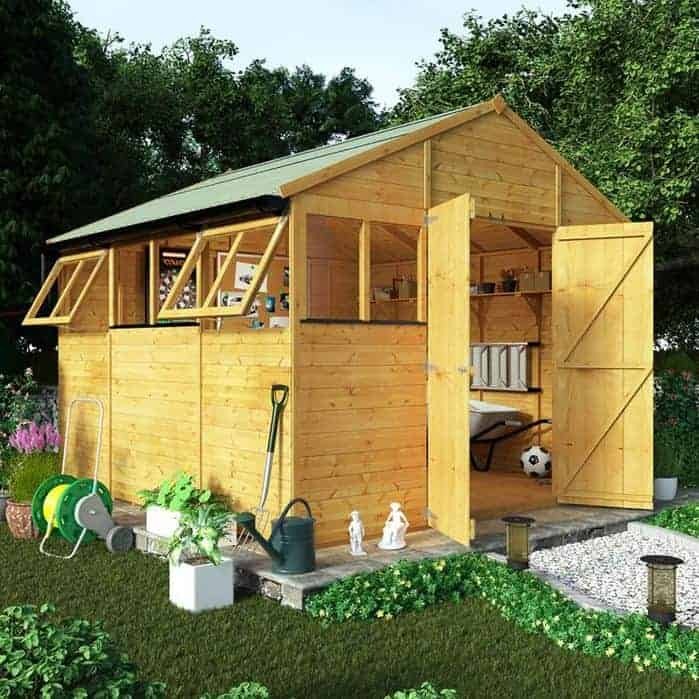 This creates a 10 x 10 shed that is both light and very airy, making it ideal for people who are looking for a shed that they can relax or work in. At the top of the shed is an apex roof covered by a strong mineral felt, which quickly carries rain and snow away. Underneath it is high quality tongue and groove cladding which locks tightly together and ensures that there are no gaps through which water can penetrate. The end result is a 10 x 10 shed that’s very water tight, and that also means that it’s very resistant to rot as long as an annual treatment with wood preserver is carried out which is why it comes with the reassurance of a 10 year warranty provided by the manufacturer. One thing instantly catches the eye about this 10 x 10 shed and differentiates it from all the others in our WhatShed guide, and that’s that it features loglap cladding rater than shiplap or overlap cladding. By its size and design, however, we can see that this is very much a large garden shed rather than a log cabin and it is therefore worthy of a place in our top 20. The use of cut log cladding creates a very strong and stable structure, and we were pleased to find that this was further backed up by a heavy duty of 44 x 70mm, which is as thick as any that we’ve seen on a wooden shed. We were also impressed by the height of the shed, with the apex roof achieving a peak height of 2.75m. 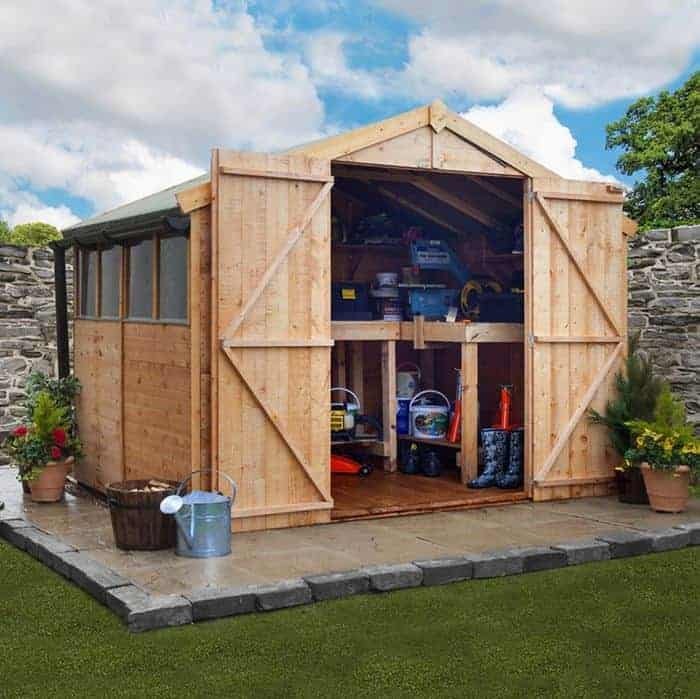 This makes it the tallest wooden 10 x 10 shed that we’ve reviewed, and this brings obvious advantages when it comes to both storage purposes and the comfort of people who are within it. There’s only one window, but its central positioning means that an adequate supply of natural light reaches the interior on a sunny day. We found a lot to recommend this loglap shed, and it’s only the price tag which prevents it from being placed much higher up our list. 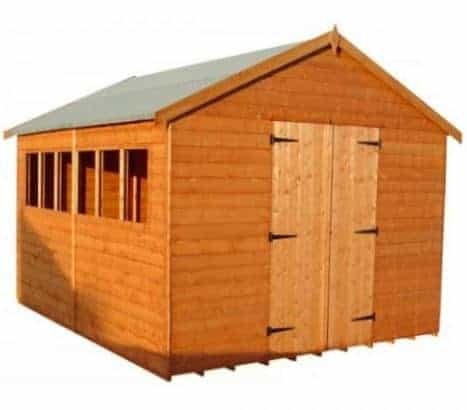 This is the fifth BillyOh 10 x 10 shed to make it into our top 20 league table, and despite being the top of the range model it also finds itself in the lowest position from this manufacturer. This should not to be taken as any indication of its overall quality, however, but simply as a result of the impact the significantly higher price had on its value for money, especially as most customers will want to further add to the initial asking price by adding a flooring option as well. 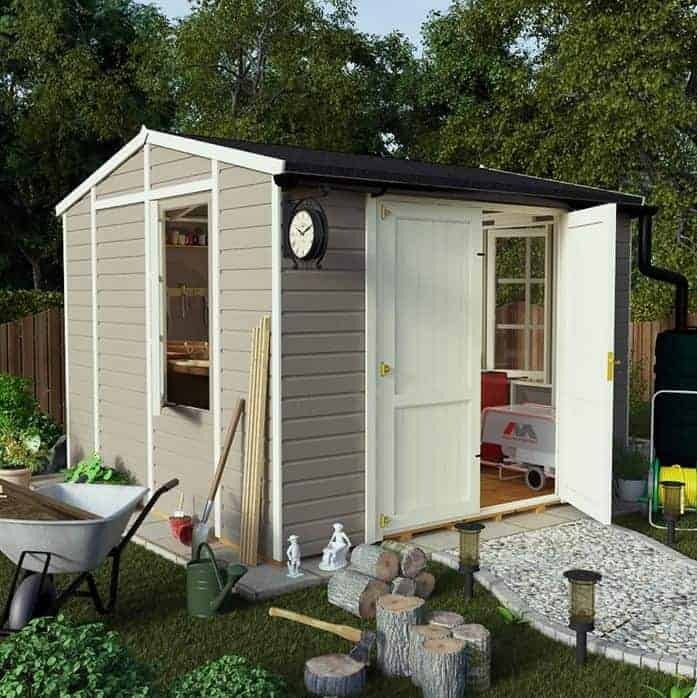 As we’ve come to expect from BillyOh sheds and workshops, this is very attractive and will certainly appeal to those who look traditionally styled garden buildings. The design feature which makes this one stand out, however, is the centrally positioned double doors which create a very pleasing symmetry as well as creating a very convenient entrance and exit point. The other interesting difference is that there are only two windows, but both are opening and both are long, so lots of light enters through them. If you don’t mind paying a little extra for a very attractive 10 x10 shed, and don’t mind carrying out annual treatments to keep the 10 year warranty valid, then this could be the one for you. This is the second security shed with a bank of four tiny glazed windows to make our list of the very best 10 x 10 sheds and it’s a feature that we always welcome as it provides a very practical solution to the need to keep valuable contents hidden away from prying eyes. This shed differs from the earlier entrant, however, by having an apex rather than pent roof. 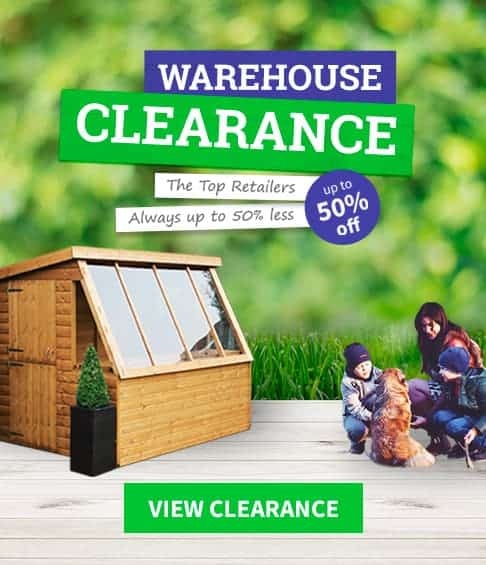 This is noticeable from both outside and inside the shed, as the extra space created by the 2.20m ridge height can make a big difference for people who plan on spending a long time inside the shed. We were pleased to see that tongue and groove shiplap cladding had been used for the walls, roof and floor, which isn’t something that we alway see on a 10 x 10 shed even at this price. We were also impressed by the heavy duty frame, measured at a thickness of 44 x 44m, so that once assembled it feels strong and rigid. This will come in especially handy for people whose gardens are situated in exposed and often windy areas. If you like the idea of having a secure shed but not having to pay to have electric lighting installed inside, then we feel that this should certainly be added to your short list. 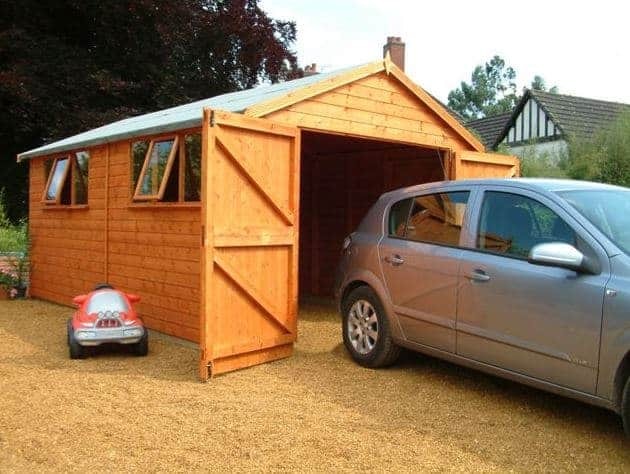 This particular 10 x 10 shed has been designed primarily as a garage, but it’s also a very versatile garden building in its own right. One reason that it’s so suitable for use as a garage is that it has wide opening double doors that have heavy duty hinges and diagonal bracing for extra strength. 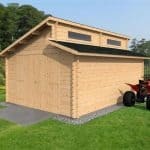 As the width of the shed itself however is only 3.05m this wouldn’t be suitable for larger cars such as many 4 x 4 vehicles. The wide doors are not only a good access point for a small family car, they’re also ideal for people who want to move furniture or machinery inside so that they can use this as a workshop. We were pleased to see that a very strong three lever key operated lock is provided as standard, and this gives extra peace of mind whether a car is being kept inside or simply a selection of tools and equipment. There are lots of optional extras that can be added to this 10 x 10 shed by the customer, which is something that we always appreciate, but we are disappointed that such a tough and well built shed doesn’t come with an extended warranty against rot and this prevents it from being placed higher up our league table. This 10 x 10 shed is reminiscent of its namesake the rhino in that it’s very tough but it also has a charge that some people may find offputting. 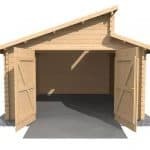 It’s this combination of a price of over one and a half thousand pounds and the lack of an extended warranty beyond the statutory one year cover that has to be offered which accounts for its position towards the foot of our top 20 list of the best 0 x 10 sheds. If, however, your budget will cover this asking price, and your happy to carry out annual preservative treatments to ensure that the threat of wet rot is kept at bay, then this is a shed that’s worth considering. 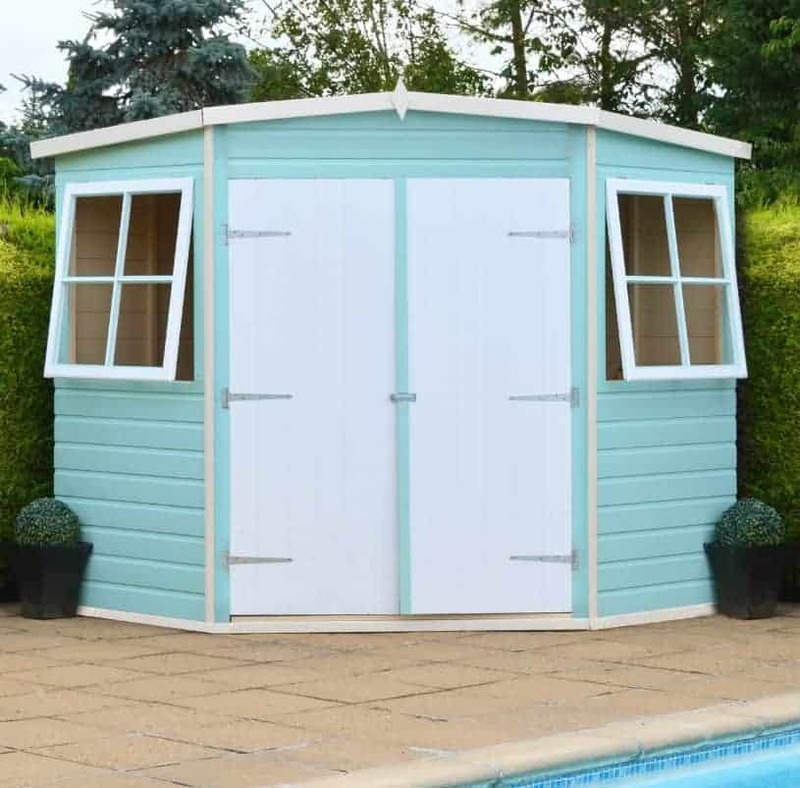 Stylistically, it follows the classic apex shed design, with a single hinged door at the front and three fixed windows on one side panel to allow light in. Where it differs, however, is in the strength of its components. Tongue and groove cladding has been used throughout, and at 22m thick it’s as strong as we’ve seen on any wooden 10 x 10 shed that we’ve reviewed. The heavy duty frame was equally impressive, and we also liked the integrated floor joists which help to protect the timbers from ground moisture rising up from below. This is another very strong 10 x 10 shed that’s been built with toughness and reliability in mind, but yet again it’s been let down slightly by a lack of an extended warranty. The reason that the manufacturer hasn’t been able to provide the kind of warranty that we would have liked to see is that the wood has not been pressure treated, and indeed has had no prior treatment at all. This is good for people who want to add their own treatment and add a colour of their choice, but it also means that the treatment will have to be applied immediately after installation as well as on an annual basis after that. 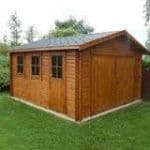 Nevertheless, this is a timber 10 x 10 shed that has a lot to recommend it, and we feel that it would be ideal for use as a workshop for either a hobby or a business that’s being run from home. The double doors provide easy access for people and goods, and we were pleased to see that they can be secured by an integrated key operated lock. There is a bank of six windows along one side of the building as well, and we were especially impressed by the extra space inside the building thanks to the elevated eaves underneath the tall apex roof. A high quality 10 x 10 shed such as this can make an ideal workshop for people who run a small scale business from home, and that’s an increasingly large demographic. With a width and depth of 3.04m each there’s lots of space to store good and products ready to be sent to customers, to install machinery that can be used for craft or manufacturing purposes, or to have computing equipment so that this shed can double up as a home office. The inclusion of two fixed windows on the front gable, one on either side of the double hinged doors that make it easy to bring items in and out, as well as two wide opening windows on one side of the building mean that once inside you’ll be impressed by how much natural light is available. We feel that natural light is essential for a workshop, as it’s friendlier on the eyes and creates a more pleasant environment to spend extended periods of time in. Once again, it’s only the lack of an effective pre-treatment and the lack of a long ant-rot guarantee, along with a higher than average price, that prevents this versatile and good looking 10 x 10 shed achieving a hugher position in our WhatShed league table. We were struck by the appearance of this pent shed on first sight, as it follows the classic design which has been making UK gardens look beautiful for decades. It may lack the extra height that an apex roofed 10 x 10 shed can provide, but the pitch of the roof means that it’s just as effective when it comes to channelling rainwater away, and it has a more subtle and less obtrusive appearance that can help it blend seamlessly into a garden background. On this occasion there’s not even much of a loss of headroom, with the 2.15m ridge height being complemented by a 1.94m eaves height. This means that the interior can actually feel more roomy than many of the apex sheds we’ve reviewed, and it’s also very light thanks to six windows, a mixture of fixed and opening, running along one side of the building. This then is a 10 x 10 shed that feels spacious, light and airy and that looks very traditional and attractive too. If it had been pressure treated and therefore came with an extended warranty period, we would have given it a much higher final positio in our league table even with its higher than average asking price that could place it beyond the budget of some consumers.